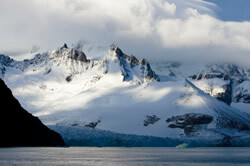 I recently posted on the unexpected loss of ice on the Antarctic continent. Here’s an update: Hugh F.J. Corr and David G. Vaughan, two scientists from the British Antarctic survey, have recently published findings in Nature Geoscience of a layer of volcanic ash and glass shards indicating an old eruption from an active volcano, the heat from which may be thinning the ice of the Pine Island Glacier in West Antarctica. The eruption that deposited the ash and glass was most likely deposited around the time of Alexander the Great. Buried by the ensuing millenia of snow and ice, the deposits where discovered by recent radar surveys. These recent findings notwithstanding, most glacial scientists, including Vaughan, attribute the overall glacial thinning in West Antarctica to warming oceans.